Our 15mm Snap Frames clip open allowing rapid poster changing while the snap frame remains wall mounted. Snap Frames with a narrower 15mm profile are perfect for smaller posters. 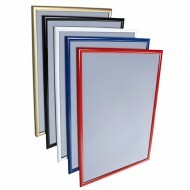 Our snap frames have 1.5mm rigid plastic back panels and UV grade anti-glare PVC covers. They are individually boxed and are supplied with fixings. Our Snap Frames are premium quality. Our 15mm Snap Frames are delivered next day. We also supply bespoke snap frames, though these are not available with 15mm profiles. We also stock snap frames with 25mm and 32mm frame profiles.